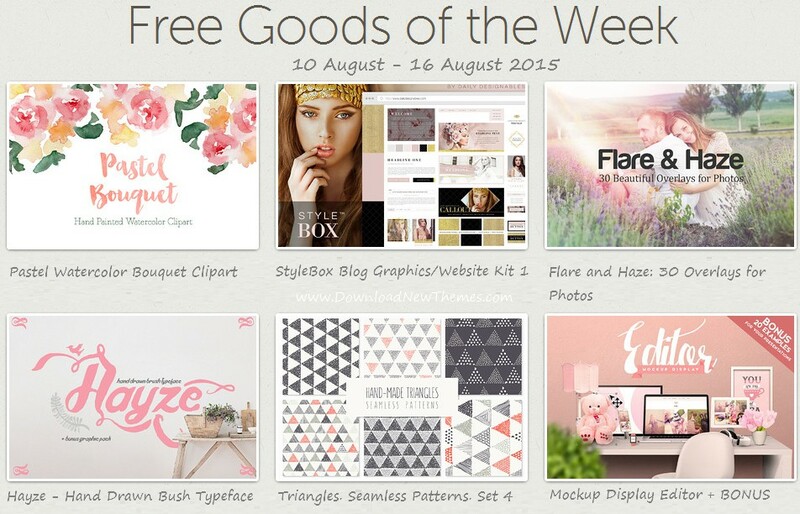 They have released this weeks freebies: 10 Aug 2015. They’re available until midnight on the 16 August 2015. Grab this weeks freebies from across Creative Market. This Hand Painted Pastel Watercolor Bouquet Clipart is for one floral bouquet. You will receive a JPEG and PNG of the design. Both files are 300 dpi and ready to go! This weeks free graphics elements on creative market. Style Boxes are a comprehensive style toolkit for your new site or brand within a single and well organized Photoshop file. It included with each Style Box is a supplemental PSD file containing full size textures, vector elements and backgrounds used within the design. This weeks free graphics web elements on creative market. Create beautiful soft photos with colorful effects using these flare and haze overlays. This overlay pack includes 10 sunflares, 10 flare overlays, and 10 haze overlays. Simply place them over your photo and experiment with different blending modes. This weeks free Photoshop elements on creative market. Hayze is a hand drawn typeface using ink and brush. Brought to complete your sweet and romantic design. The typeface is great for invitations, quotes, headings, t-shirt, labels, posters, etc. This weeks free bush typeface on creative market. Triangle seamless patterns set includes Vector EPS format, Vector AI format and 6 JPEG files. This weeks free seamless patterns on creative market. It is a great collection of mockup display editors. Its useful for Header Images, Presentations, Device Mockup Presentation, Website Preview, Image Slider, Product Mockups, Etsy presentations and more. This weeks free Product Mockups on creative market. Item Reviewed: Download Amazing 6 Free Design Goods 9 out of 10 based on 10 ratings. 9 user reviews.